We really are living in the Golden Age of television! There are more ways to watch our favourite shows than ever before and a high quality of broadcasting means that there is almost always something worth watching. Sky, Netflix, Amazon Prime, Freeview… there are plenty of choices. Choosing a digital TV package can sometimes seem overwhelming. But when you choose to use Money Pug’s handy comparison service, it is easier to see all your options in one place and to find the right deal for you. Is HD broadcasting a must have for you? Do you want the freedom to pause, record and rewind live TV? Are you keen to watch on-demand TV services? Are you into sports, documentaries or movies, will you want any additional packages? The quality of the broadband service (if included) – speed and data allowance. Installation cost (if there is any). Set-top box cost (if there is any). The length of the contract offered. The TV shows that you are keen to see (some of which may only be available on specific options). What Sorts of Digital TV are available? With satellite TV, the TV is delivered into your home via communications satellites, which beam signals to a satellite dish and receiver box in your home. In many homes across the UK, it is also possible to get digital TV through the UK’s cable networks. Cable TV is delivered into your home using a network of fibre optic cables. With this option, TV is delivered over your broadband Internet connection. Freeview is a free, terrestrial digital TV service, which is accessed through a set-top box. YouView is a subscription free TV service with over 70 digital channels and seven-day catch up on on-demand TV channels. These boxes come free with BT and Talk Talk bundles. Should I get a TV Bundle with Broadband and Home Phone? Many service providers provide great deals when you choose a package which includes TV, broadband and home phone service. Choosing one of these deals could offer a cheaper monthly cost than going for each of these services separately. Having only one bill can also be more convenient. Do I have to Get a Satellite Dish for my Home? How could I watch movies on my TV? The cheapest way to watch movies on your TV is simply to tune in to free TV schedules and watch whatever films happen to come on. Freeview lives up to its name – it costs nothing to watch over 70 channels, including film-dedicated channels such as Film 4 and the Sony Movie Channel. Of course, if you opt for Freeview, you won’t have a huge amount of choice. You’ll be subject to the whims of TV schedulers and will have to depend on them choosing to air movies that you want to watch. Another alternative is to pay for TV via satellite or cable. Pay TV customers will obviously have access to extra channels that are not included on Freeview, so there will be more movies in the schedules to choose from. Of course, you can also opt to pay extra for dedicated movie packages. Sky Cinema is the biggest of the movie TV packages that are available. It offers its viewers no fewer than 11 dedicated channels for watching films on your TV. Films are ordered by genre, so you can find specific types of film such as sci fi, or dramas. There will also be dedicated channels available at certain times – showing Christmas movies, for example, around the festive season, or Academy award nominated and winning films, around the time of this awards ceremony. Of course, all these movies come at a cost. You will generally have to pay around £10 for Sky Cinema, in addition to paying the cost of the basic TV package. Other pay TV film packages include options from Virgin Media, TalkTalk and BT. These companies all offer the option to bolt Sky Cinema on to their existing bundles. Money Pug can help you compare, to work out which movie TV package might be best for you. If you are looking for a particular recent release, you may also have the option to buy or rent particular movies from your provider’s online store. If you want to save money, switching from a pay TV movies package to an on demand movie streaming option could be the best option you you. If you have a smart TV, fire stick, set top box or games console, you can turn your living room into a home cinema, streaming movies whenever you want. You can choose one of the most popular options for watching films on demand. Netflix costs around £6 per month and has an impressive catalogue of films to watch whenever you want. Another option with plenty of films to choose from is Amazon Prime Video. The fee for this is around £8 but also comes with free next day Amazon delivery. Sky also has a film streaming service – NOW TV. 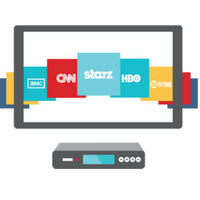 Which movie TV package is right for me? Which movie TV package you choose to go for will depend on your budget, your viewing habits, and preferences. If you only watch the occasional movie on the weekend, then you are probably best off just sticking to Freeview. If you will accept nothing less than all the best blockbusters on your TV, and have the budget to indulge your passion for the latest movies, then a pay TV movie package could be for you. If, however, you are a film buff who likes discovering new movies to share with friends or your loved one, and don’t like to live life to someone else’s schedule, then on demand streaming will probably be the option you choose. Whatever you decide, keep in mind your options for watching movies, and how and when you like to watch them, when deciding which TV package to choose. How could I watch sports on my TV? Freeview is, of course, free to view. Some sporting events can simply be watched for free on the 70 plus channels available free of charge. The biggest and best known sporting events must, by law, be shown on Freeview. These include the Olympics, the football and rugby world cups, the Grand National and Wimbledon. However, there will be a good number of sporting fixtures throughout the year that can only be watched on a pay-to-view channel. If you are a huge sports fan, and don’t want to miss any of your favourite games, matches or events then you may wish to consider a subscription based sports package. The main two options in this regard are Sky Sports and BT Sport. (Virgin media offers the chance to add these two to their subscription.) Sky has ten dedicated sports channels, and BT has four. Of course, choosing this option comes at a cost, as you will have to pay a monthly fee to watch sport on your TV in this way. One final option, if you don’t want to pay every month to watch sports on your TV, is to choose to get a pass to watch sports channels only when you want to, through Sky’s NOW TV. If you go for this option, you can get a pass just for the days when there is a game or event that you particularly want to tune in to. Which Sports TV package is right for me? If you only watch sports every now and then, or are really only interested in watching the biggest sporting events, then Freeview will probably be fine for you. If you want to catch specific sporting events or games not shown on Freeview, an occasional pass from NOW TV could be right for you. If, however, you are a mega sports fan, then you may want to consider a subscription service, so you can watch every live sport event you want to at any time. How can I watch TV programs on demand? Even if you are strapped for cash, there are still plenty of on demand TV options that you can enjoy on Freeview for free. BBC iplayer, ITV player, All 4 and My5 are all examples of this type of service. Most are funded by advertising, though iplayer is owned by the BBC so you will need to have a TV license to watch. Sky customers can get access to around 60 on demand channels via their +HD or Sky Q Box, including programmes from exclusive channels like Sky Atlantic (home of hit TV shows like ‘Game of Thrones’). Virgin Media also offers a range of on demand services, with different levels of access depending on which TV package you choose. BT and TalkTalk only offer their on demand services as part of a broader broadband and TV package. If such on demand TV is not enough for you, you can also get box set bundles from Sky or Virgin Media, with a range of complete TV series that can be watched on demand whenever you like. By paying a monthly fee, you could also consider watching a wide range of TV on demand from streaming sites like Netflix, Amazon Prime or NOW TV. Vast libraries of TV content are available, so if you opt for this option, you should never be short of something to watch on demand. Which TV on demand option is right for me? If you simply want to catch up on your favourite terrestrial TV shows, then the free on demand channels may well be enough for you. Just remember that you will need a TV license if you want to watch BBC iplayer. If you love binge watching a wide range of TV shows, on demand streaming from Netflix, Amazon Prime or NOW TV would probably be your best and most affordable option. If, however, you are already a Sky or Virgin customer, upgrading to a box set bundle would also give you plenty of choice.